Simple, fast set-up and a proven registration system give you the ability to print precise four-color (or three-, two-, or one-color) designs in perfect registration on clothing and other items. 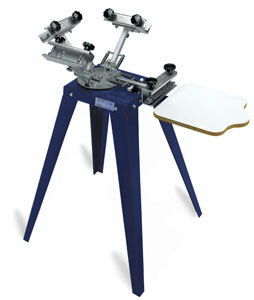 Bench models (no legs) are designed to be mounted to a workbench or table. Increase productivity as you go from one station to two station models, and add rotary load. Springs support the screens in up or down positions. All-steel construction. Screen head is mounted on ball bearings. Each station includes one 14" × 14" neck platen with a white, easy-clean surface. Two-Station Rotary Load — The key to rotary load is that one person does the printing, while others unload and load the garments. Improve quality and increase production. One/Two Station with Microlok — The three adjuster barrels allow you to position screens in perfect registration after the screen is clamped.